Frida Kahlo, since her death 62 years ago today, has become such a staple of American culture so as to seem ubiquitous. Her indelible, inimitable self-portraits have been reproduced on coasters and playing cards, earrings and t-shirts, pillow cases and pajama pants. Each Halloween, thousands of revelers across the States alone will dress up as her, not least because she’s so easily recognizable, and therefore so easily approximated (rose crown; kohl monobrow; common huipil, or something like it). Who wouldn’t want to slip into that indomitable spirit for a night, a fighter in philosophy and physicality, a genius talent whose estimation of herself was as clear-eyed and complex as any painter of her time or ever. Whomever’s making money off Frida Kahlo’s visage—remaining Kahlo familia, whomever was in Dolores Olmedo’s will—it’s also true that her body of work and everything she represented was and is resolutely specific, and completely immersed in and of the culture of México at that time. She was proud of her country, loved who she was, and by extension her fierce presence has been a beacon for Mexicans and Mexican Americans who feel the same. Especially in a time when the hostility towards Mexicans is so strong—and let’s be clear that it’s not just immigrants, it’s Mexicans as a whole, whether here or there—it’s important not to let Kahlo become neutralized in the States, the same way white girls wearing huipils as a cool fashion statement so often seem less concerned with what they represent than with how they’re accessorizing. It’s important to remember that she was not only fealty to the country and culture of her birth but that she was also resolutely political, in her actions and her paintings. In October, Kahlo’s 1932 painting “Self-Portrait on the Borderline Between México and the United States” will be on display in the Philadelphia Museum of Art, in an exhibit celebrating Mexican modernism in the first half of the 20th Century. It depicts her with a skeptical eye and a Mexican flag in hand, juxtaposed against México—a crumbling Mayan pyramid struck with lightning, a skull and pottery and flowers level to the earth—and the United States, smoggy and industrial, the fumes from a Ford plant enveloping the American flag, which looms like a kind of God. Kahlo painted it while living in the United States while her husband, Diego Rivera, was under commission by Edsel Ford to paint a series of murals in Detroit. (Those murals, the ones whose clear Marxism scandalized a rapidly industrializing country.) She despised it here, and had just had a miscarriage; she was lonely, a communist in a capitalist stronghold she nicknamed “Gringolandia” and, in the painting, critical of the way US culture prioritized mass production over more natural, earthbound concerns. While Rivera continued to chase success in the US with new commissions for murals across the country, Kahlo was distressed by what she saw in North America. The roots of her anti-capitalist sentiments are somewhat explained in an introductory catalogue entry by the curator Matthew Affron, who notes that Mexico’s 1917 Constitution was a crucial influence on the country’s artists in the early 20th century. “That document—still in effect today—affirmed national ownership of natural resources, a progressive labour code, universal public primary education, and the separation of church and state,” Affron writes. It’s ironic, of course, that even though she was a master at disseminating her image it’s now used to make negligible amounts of cash on magnets and greeting cards and other things we can surmise she would have loathed. Artists, of course, are often commercialized beyond their control or wishes while they’re living and after, whether their political beliefs adhere to that or not. But on this anniversary of her death, stoic and agonizing to the end, we can remember her convictions—especially as Xicanas, as Xicanistas, as Mexican Americans, as Mexicans—and remember the culture she so beloved is ours, too. Images via AP. 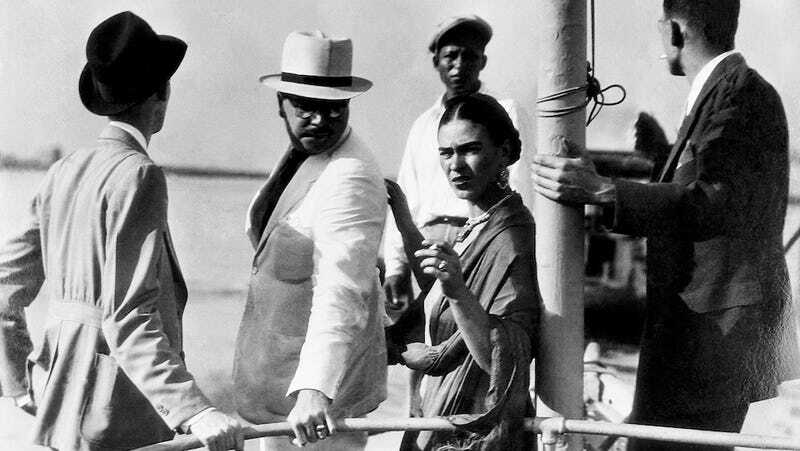 Top, Kahlo greets alleged lover Leon Trotsky in 1937; middle, Kahlo at home in DF in 1937.